like a glass of Irish Whiskey in a warmed glass. I’m not saying I’m one of those people who drinks constantly. Heck, now days I probably drink about once a week if I am lucky. (Well, as of last week I’ve limited myself to one drink per week.) I will admit sometimes I do go over board during certain occasions when I’m surrounded by the right formula of friends (weddings, homecomings, and Tax Day), but we’ll leave that portion of my life out of this blog because there is nothing healthy about being drunk and eating Pizza at 2:00 in the morning from a sketchy food truck. Unfortunately this is the part where I break out some bad news. (Cue the serious music, dim the lights and cut to a dramatic commercial break.) Alcohol can make you fat, but honestly I didn’t have to tell you that. Any college kid who with a wild yet sometimes lethargic side can tell you how after their 21st birthday (or freshmen year) they blossomed and gained that dreaded pants size (or sizes, in my case). The term “Beer belly” wasn’t coined just because it’s fun to say–I’ve drank enough Pabst Blue Ribbon to know that beer has a way of making Extra Large shirts feel more like Extra Small shirts. But why? Let me have a quick aside–I will be honest, when I first started this post I thought it would be an in and out deal. I thought I could slam out a quick post and give it to you straight out. I could and probably should just say “Alcohol is bad for you, damn it!” However, I’m a realist (who loves the sound of his own voice) and I decided to do a little bit of homework, unfortunately I opened a can of worms leading into a never ending maze of conflicting reports and biased opinions. I can’t help but flash back to various health classes discussing how alcohol is a poison/toxin which acts as a depressant. Yet, I also can’t help but flash back to college sitting on the front porch of my house “The Swamp” sipping some Red Stag on the rocks enjoying a spring day. We shall be considering this post the first in what will be a scattered and long series of posts about booze (others will be far shorter, I promise). Enough with the rambling, where was I? That’s right, why alcohol makes you fat. Unfortunately for those trying to attain the Gerard Butler or Jessica Alba physique, Alcohol is basically as energy dense as you can get. Hell, you can run cars off of booze. Pure 100% Ethanol is about 238 calories for just 1.5 fluid ounces. That’s right, one shot of pure shot of ol’ “white lightening” is about the equivalent of one donut. On the bright side, most of us are not college frat boys curling up next to a bottle of moonshine or Everclear trying to escape the stressors of adolescence, so we won’t be downing that 238 calories per each fluid ounce we intake. On the down side, that still means there are still a boat load of calories shoved into your lovely little umbrella boat drinks since I most of us aren’t cutting our booze with water, after all. Yup, alcohol is a calorie commitment so instead of being debbie downers, we will be rebellious Rodgers (if there are such things) and DRINK SMART! On Calwineries.com they have some of calorie listings to some famous mixed drinks. (I will admit that the calories in mixed drinks fluctuate a lot depending on the brand and alcohol used, but we’ll just assume this is around the ball park of what you’d get if you ordered these drinks at any bar.) A Long Ice tea is 550 calories for 5oz, a Mai Tai is 640 for about 9 oz, and 6oz of a Mudslide is 660 calories. Now if we’re going to be honest with ourselves, usually if we’re drinking a mixed drink it’s about two to three times the size of of these claimed serving size. (Maybe this explains why I usually end up unzipping my pants when I drink four or five long islands, but that still doesn’t explain why I start singing Elvis.) Cal Wineries is also polite enough then to add that a Big Mac is about 550 calories. (No wonder my pant size expanded when I turned 21.) Basically, the popular beyond delicious mix drinks aren’t geared towards keeping that mythical six pack or Brazilian booty. “Get Drunk Not Fat!” seriously, there’s an app for that. 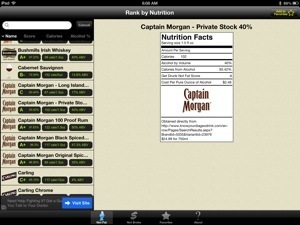 Just a couple of weeks ago I was messing around with my iPad looking up drink recipe Apps for fun and I discovered the “Get Drunk Not Fat” (GDNF) App [www.gdnf.com]. People joke around constantly that there are apps for everything and holy sh–cow there was an app for staying fit and getting drunk. Now I only showed you GDNF because it has a funny name and purpose, but most calorie counting websites contain the calorie content for most alcoholic beverages. Remember all brands are different due to ingredients and alcohol content. You can also check the manufacture’s website because now days a lot of them have nutrition information. REMEMBER TO ADD IN YOUR MIXERS TO THE CALORIE COUNTS! Seriously, sodas and juices are notoriously high in calories and sugar. Not to mention the cream and syrups which are included. Maybe in the next post I’ll share some “healthy” concoction ideas. Finally, I’m almost done talking. I will eventually be writing about and analyzing the possible health benefits of alcohol because I would like to rationalize why a drink or two might actually be beneficial, but until then it’s probably best to cut down your booze consumption just for calorie sake. Your gut and liver will appreciate it. I realize this post was tediously annoying for my taste and it didn’t really say much “watch your calories,” and “try GDNF”. I will try to post one “review” or “recommendation” per week and one update on my current weight-loss struggles and condition. Ps. If you actually read this whole thing, then next time we hang out I’ll have to buy you a nice cold Pabst Blue Ribbon.